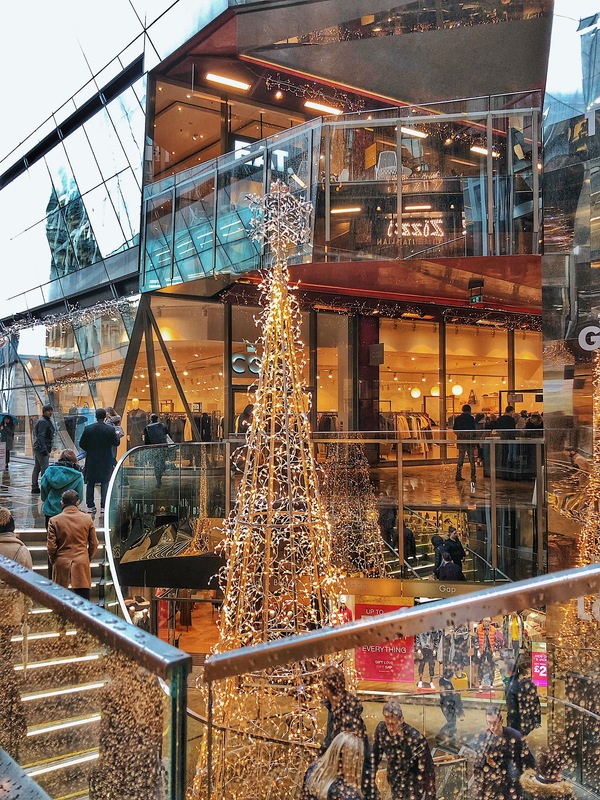 But if you've only got a day and want to experience a little bit of everything festive - Christmas markets, shopping for party outfits, incredible food and beautiful views, then you'll need to stick to just one area to save on travel time. And I've got just the place for you. 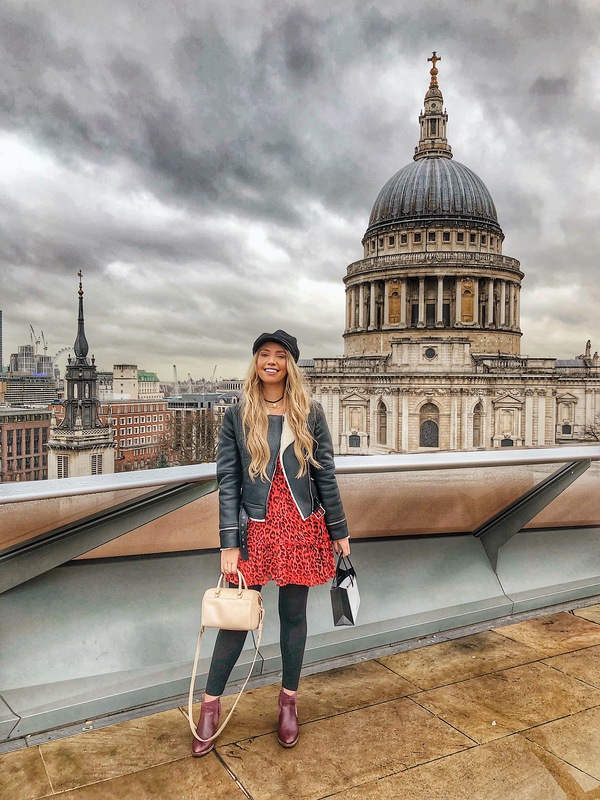 With an abundance of shops, restaurants, food markets, spectacular lighting displays and gorgeous views over the city, One New Change (near St Pauls) is the ideal spot. My friend Heather and I recently spent a day together exploring all that the area has to offer for guests at Christmas and we had the most fabulous day. So sit back, grab yourself a mince pie - and let me take you through your ready made itinerary for a must-visit Christmas destination. I don't know about you, but there's nothing like a blow dry to ensure you feel as glamorous as humanly possible. So we started our festive day off with a blow dry at Hershesons, where you can choose from a 'hair menu' of different looks and be perfectly coiffed within 30 minutes (45 if you have longer hair). Depending on where your day might be heading and how much time you have to spare, you can opt for the 'wavy gravy', the chic 'dirty ballerina', the 'swank' up-do or the 'smooth wavy'. It's the ultimate city fix, especially if you've had an early train to catch and zero time to perfect your hair - and the perfect way to get you ready for a busy day of shopping and dining. Every Christmas, I treat myself to a really special festive outfit - to see me through the party season. This year, I'd left things a little late, so I booked myself in for a personal shopping session with the Reiss stylists to expedite the process (I'm usually quite an indecisive shopper when it comes to clothing for myself) and what a fabulous decision this was. I'll be the first to admit I've never had a personal shopping appointment before, but my goodness - I've been missing out. The service at the One New Change branch was impeccable - with every single member of staff in the store welcoming us upon arrival and offering their suggestions. I honestly felt like royalty. Zip and Kai the in-house stylists chose a rail of clothing based on the information I'd given them (my IG page and my size) and even with minimal details, they were somehow able to grasp exactly what it was that I wanted. 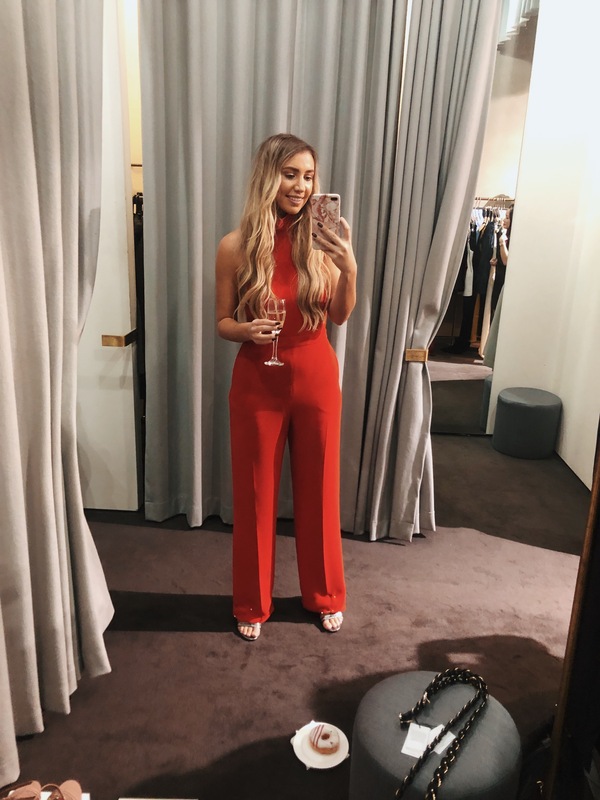 The process was made even more luxurious with a glass of prosecco in hand - and I only had to try on three outfits before I knew I'd found 'the one' - a gorgeous red jumpsuit with a high neck. The fact the legs were just a little too long for my 5'4 frame was no problem either, as they pinned them up for me and whisked them away to their same-day tailoring service - so that I could collect my new party outfit at the end of the day! 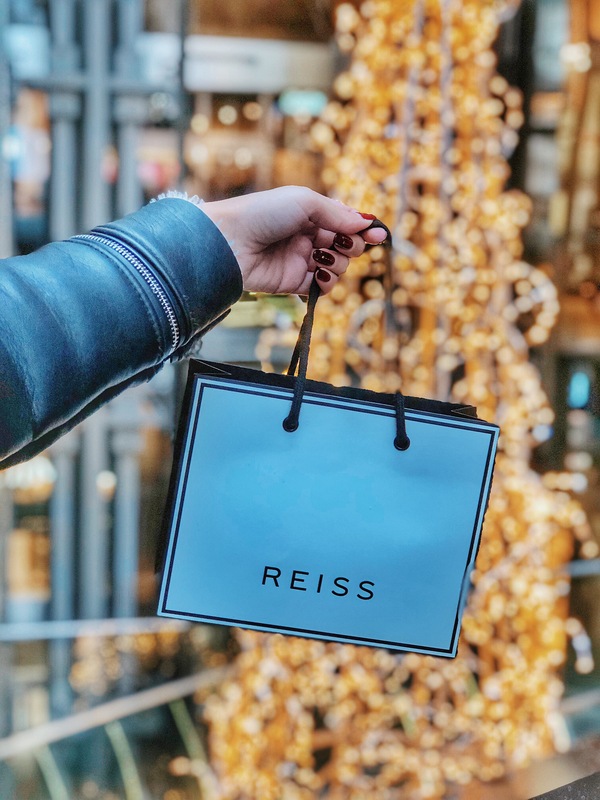 I'm already planning to bring my boyfriend back to this particular branch of Reiss for his very own personal shopping and styling session (because I have absolutely zero clue when it comes to guys clothes) since the service was absolutely incredible. The session is free (just ring or email to book) and a great way to get professional help if you're wishing to update your wardrobe or pick up a party outfit! Christmas markets are one of my favourite things about the festive season - there's something so cosy and exciting about browsing each tiny stall, a surprise to the senses! At One New Change the festive market stalls were mostly food based (which gets the big thumbs up from me, quite frankly) and showcased a variety of snacks, sweet treats and lunch options. At 1pm, the markets were crowded with the lunch-time rush, so I'd recommend popping by a little earlier if you don't want to miss out! The regular food markets at One New Change are held every Friday, from 10am-3pm and every other Wednesday. Our favourite stalls included 'Bad Brownie' which had its very own Salted Caramel Vegan Chocolate variety - which just happened to be the best brownie I've ever tasted. And that's a big statement. My only regret is being a little too reserved and only buying one to share! 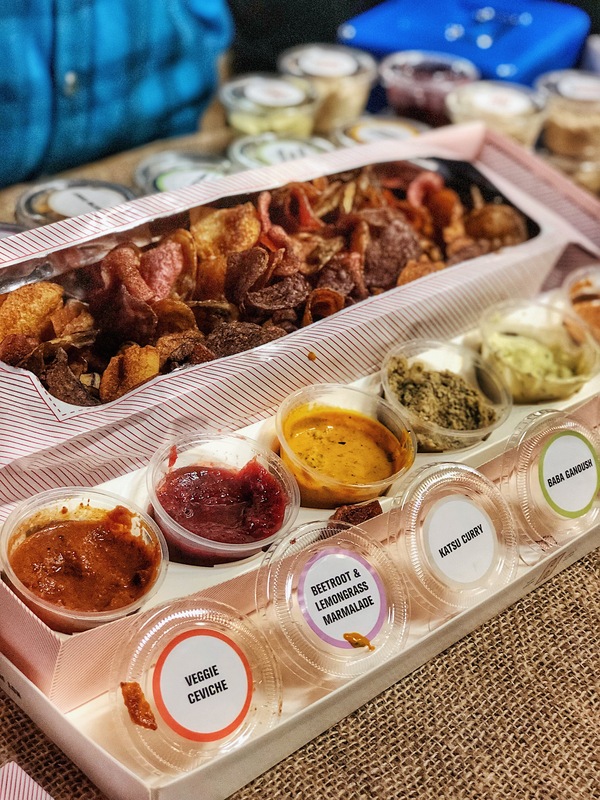 Then we popped by the Hipchips stand - homemade potato chips with your choice of dips - we opted for beetroot and lemongrass marmalade and baba ganoush. Again - I wish I'd stocked up as these were incredible and would be fabulous for entertaining at home over the Christmas period, but I only picked up one box! Try not to fill yourself up too much with all the festive delights on display at the markets, because a variety of dining delights lay waiting for you under the same roof. One New Change has a couple of well-known favourites such as Nandos, Wahaca, Byron, Zizzi and Wasabi, however if you fancy something really special - head to Gordon Ramsey's Bread Street Kitchen. This buzzing hive of activity is extremely popular - so it's worth booking, but the menu is famed for its incredible steaks and cocktails – perfect for a festive lunch with friends! I had the 'Love Potion' - a sweet concoction of prosecco, raspberry and port, while Heather had a salted caramel espresso martini, which was just as decadent as it sounds! 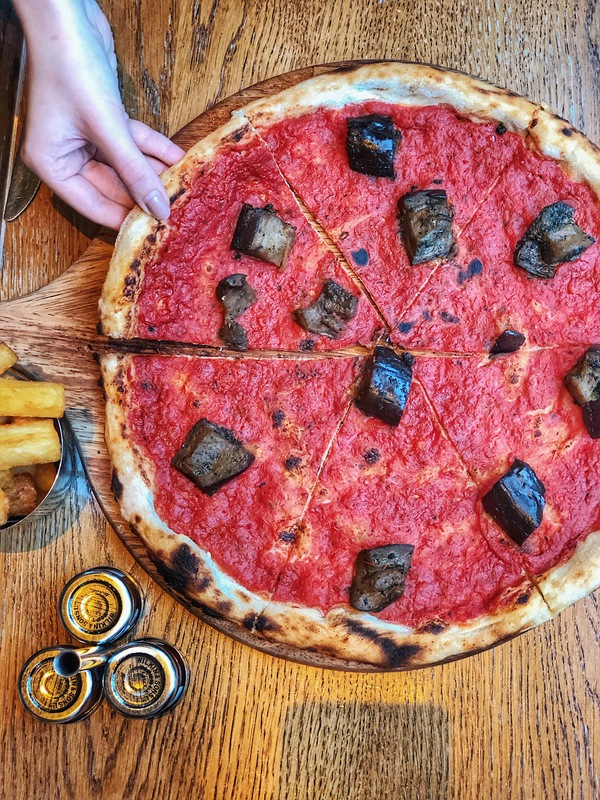 The portions are rather generous - so we shared a vegan pizza and a pumpkin soup, as well as a portion of triple cooked chips, which went down an absolute treat. 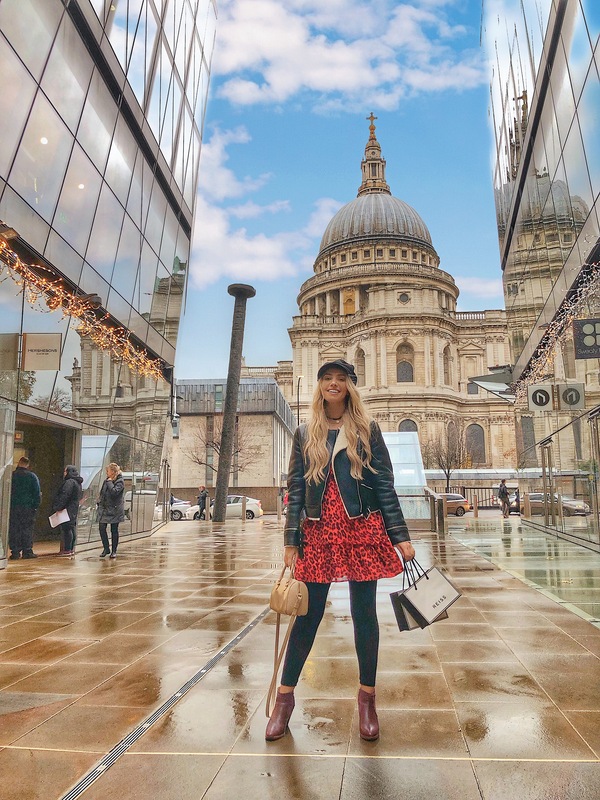 One New Change is filled with an abundance of spectacular Instagram opportunities - with gorgeous views of St Pauls and stunning mirrored glass reflecting the light in magical ways. 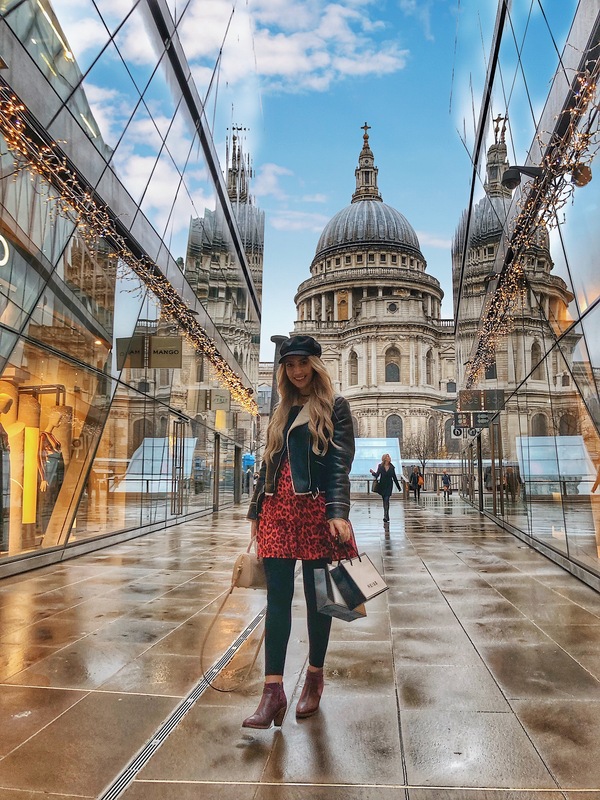 If you simply can't leave without a shot for the gram, my personal recommendation is a 'mid-shopping' shot with the cathedral peeking through the shops either side. You won't be able to miss the location! 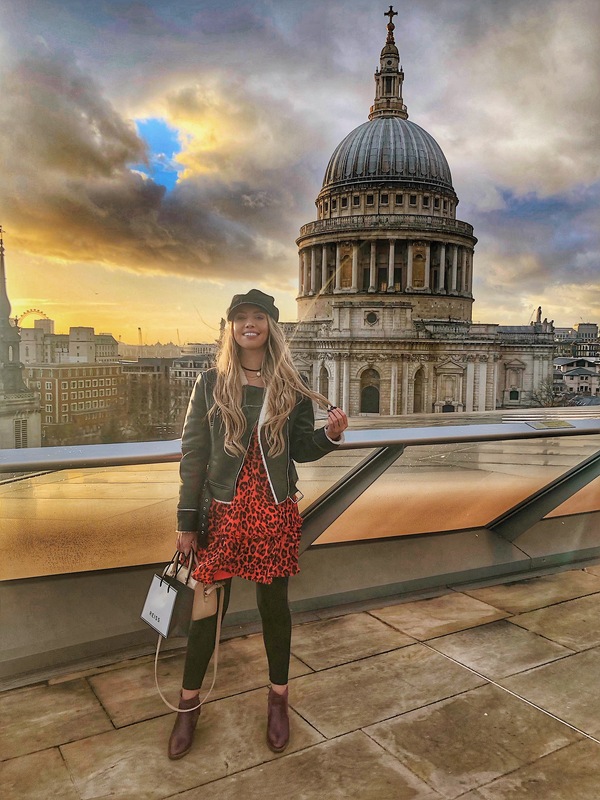 Otherwise, the rooftop is another fabulous photo spot with stunning views of the London sky-line, which is best enjoyed at sunset when the city twinkles back at you, and the hazy sun turns a stunning orange colour as it peeks through the clouds. After adequately re-fuelling, the rest of the afternoon is yours to shop! For Christmas gifts, I'd highly recommend popping into Hotel Chocolat for sweet treats, or Pandora or Accessorise for jewellery. H&M is a great all-round option if you're buying any clothing gifts, and Next is fantastic for home-wear and fashion. Molton Brown is also great for luxury stocking filler ideas. Finish your day with a cocktail (or two) on the rooftop of One New Change - where Madison awaits you with blankets and heaters to help you enjoy the stunning view, despite the cold weather. You could opt for a refreshing Mexican Fresco, or a smooth Madison Sour. Just make sure you're in place with your cocktail in hand ready to watch the sun go down over St Pauls Cathedral. The last glow of the day peeking behind the stunning architecture of the city I'm so grateful to call home! Have you visited the One New Change area this Christmas?